Last Friday saw an extraordinary number of Ontario’s financiers in the MaRS auditorium. Why? The Green Energy Act has brought into being an entirely new class of financial asset: financing Feed-in Tariff based renewable energy projects. In easy terms: the FIT guarantees a good rate of return for wind, solar, hydro and biogas projects. It’s like a government guaranteed bond that pays upward of 10%. On Friday, MaRS was educating Bay Street about the opportunity. The message: renewable energy projects are no longer a fringe play; they’re a strong, mainstream finance opportunity. 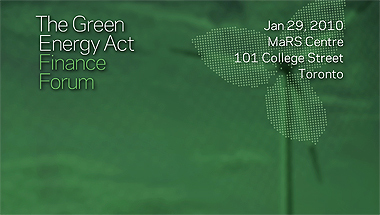 The Green Energy Act puts Ontario on the map when it comes to cleantech, big-time. And MaRS provided the stage for the first real discussion within the financial community about the opportunities it opens up. The objective? To accelerate the flow of large capital into the sector. Even Premier McGuinty dropped by. Many of the presentations that day are available online. My message to the crowd? The Feed-In Tariff is just the beginning of the biggest infrastructure play in human history: our transition to a low-carbon economy. For financial institutions who play it smart and develop a strong internal capacity for understanding how to finance that transition, the FIT will be the start of an on-going strategic advantage. The event was sold out and the room was still packed at the end of the day. The presentations were smart, the audience interested. This just might be the start of Bay Street getting serious about cleantech. My thanks to all those MaRSians who help make the event a success!